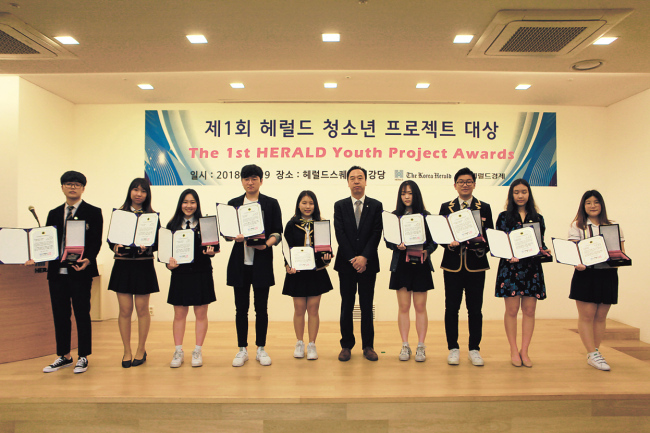 The Herald founded the Herald Junior Project Award this year for students who suggest a vision for the future and achieve outstanding competence while carrying out challenging tasks. The award is intended to empower students to become future global leaders. Today’s youths will lead in a borderless society that cuts across races and cultures and head diverse organizations including government, NGOs, international organizations, and profit-making corporations and serve the members of those organizations. In order to become such leaders, our youths need insight and understanding of the global agenda, the will to overcome challenges, and the capability to suggest a vision for the future. They will also need the capability to contribute to world peace and prosperity, to understand and accommodate pluralistic cultures and to positively affect people. The Herald selected 10 disciplines on the basis of such a threshold: human science, social science, international relations/diplomacy, economy/management, natural science, media, environment, society contribution, human rights and architectural culture and found as many promising students for each project. We anticipate the Herald Junior Project Award to become a platform for the youths to grow as global leaders and contribute to international society.